After the death of his clan master, Wu-Lin leaves the village for the City of Stone-cold to protect the daughter of the richest family in the city, Fei-Fei. When the city s most dangerous gang attempts to kidnap Fei-Fei, Wu-Lin is forced to fight them alone and discovers an even more sinister power is taking over the city. 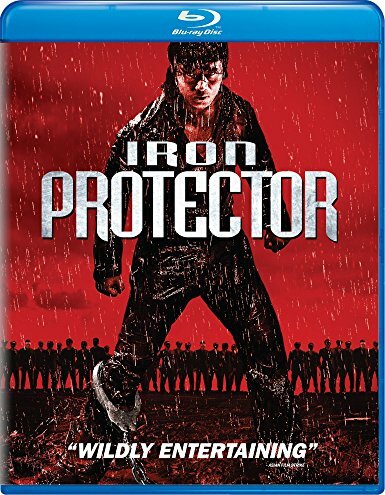 Iron Protector is a Hard Hitting Action Film that showcases Iron Fist and Feet Combat. Are Main Lead is a master at his skill, Taught by his master whom he carries his ashes around. After protecting a guy who was being chased by punks he is hired to protect him and his daughter through the company he was just hired at. This company specializes in bodyguards which his friend works and runs. His friend is a Student of the iron technique too but was kick out by the same master before learning the iron feet. The Owner of this company wants are lead to be killed and forces his friend to bury him alive. But he isn’t dead yet. As he unearths himself and prepares to bring hell and hurt. The Story was decent but could use work. Seems like the film should have been longer and we have missed a good bit of the story. Action wise, it was OK but most of the time I felt annoyed as the action was sped up and never was shown at normal speed. Cut Scenes came and flew by every half of a second during the action scenes. I want to really like the action but I couldn’t due to this. Also a lot of the shots where close-ups. If the action was at normal speed I would have enjoyed the film a lot more. Acting wise the film was again OK. Not a ton of Dialogue in this film as its mostly a score. Over the film was Just OK. Now From what I see a good bit of Viewers do like this film and give it higher ratings due to its hard-hitting action which it was hard-hitting. But for me the speed up during the action was too annoying for me to follow and wanted to really see the action and stunt work. Story felt rushed. If every thing was slowed down and the story expanded I feel this film could have been a fun one for me. With that said I have to give this film a 2 out of 5 stars. It’s an OK watch but more so I was disappointed at the editing and cuts. The film Looks good Visually and had good-looking camera work, also the story overall written on paper seems interesting. I say Go in slowly. This might be a film for you as it is with a lot of others. If your like me I would wait until it hits Netflix to give it a peep.